Announcing the Small Lab Handbook! 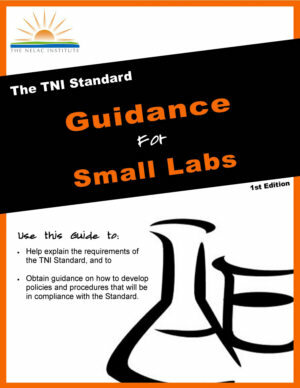 The official title for this new TNI laboratory resource is "The TNI Standard: Guidance for Small Labs", but the working title has long been "The Small Lab Handbook." The contents of the Small Lab Handbook match the TNI Quality Manual Template outline and together, these two documents assist any lab, large or small, in becoming TNI-accredited. Many years of NELAC experience is compressed into 91 pages in hopes that the small laboratory will be spared a fair amount of learning from others' mistakes. It should also benefit the assessors by making the laboratory more prepared for their first assessment. Credit for its creation goes to a number of TNI members. The initial inspiration came from Len Schantz, TNI's first Small Laboratory Advocate. The first working draft was provided by Tom McAninch who volunteered his manual for Laboratories Seeking NELAC Accreditation, a guidance document he had created for Texas laboratories. Gary Dechant then reorganized the document to match the 2009 TNI Standard, after which it was reviewed by members of the Small Lab Advocate Group (SLAG). Final editing and formatting were done by Jan Wlodarski before a review by members of the Technical Assistance Committee. So, there are many TNI members who have been instrumental in bringing this resource from idea to reality! Look for it in the TNI Store (http://www.nelac-institute.org/shop.php).